The deciding games of the 2018 Olympic Hockey Final Qualification tournaments take place today across three cities in Europe. First, in Group D, host Belarus opened their schedule with a solid 5-2 win over Denmark, while NHL star Anze Kopitar announced his intentions to return Slovenia to their second consecutive Olympics by scoring a hat trick in their 6-1 hammering of Poland. 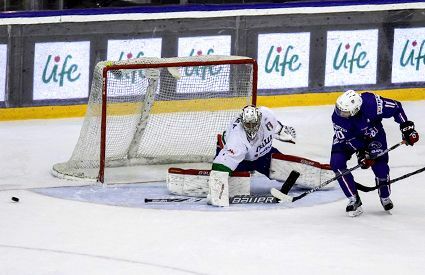 On Friday, the teams swapped opponents, with Slovenia shutting out the Danes 3-0 while Belarus kept pace with a 5-3 win over Poland to set up their winner-take-all game today in Minsk against Slovenia, as both teams enter the final day undefeated. 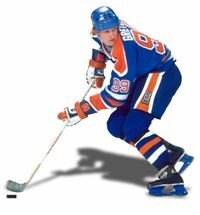 Former NHLer Sergei Kostitsyn leads Group E in scoring with 2 goals and 5 points with Kopitar right behind him with 4 points thanks to an assist to go with his 3 goals. Also with 4 points is Andrei Stas of Belarus from 2 goals and 2 assists. For the first time ever, the IIHF has made the Final Olympic Qualification games available online, as well as being free. Today's Belarus vs. Slovenia game can be streamed live here. Group E began with Germany shutting out Japan 5-0 while Latvia delighted the home fans with an 8-1 drubbing of Austria on Thursday. On top of their game, Germany recorded their second consecutive shutout, blanking Austria 6-0 on Friday. Latvia kept pace by holding off a spirited Japanese squad by a score of 3-1. After Japan and Austria play in the early game, host Latvia will attempt to overcome the German defense, which has yet to yield a single goal. With both Germany and Latvia tied with 6 points from two wins each, again, the winner of their game will advance to the 2018 Olympics in South Korea. Felix Schultz has 3 goals and 4 points for the Germans to lead the group in scoring. Today's Latvia vs. Germany game can be streamed live here. Things have been slightly more complicated in Group F. In the opening game on Thursday, France and Italy traded goals in the second period and couldn't decide the game in regulation time. The extra period would not last long though, as Stephane da Costa would win the game for France just 27 seconds into overtime to give France 2 points in the standings to Italy's 1. 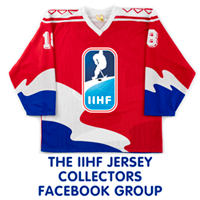 In Thursday's second game, Kazakhstan and host Norway traded goals in the first four minutes of the second period before the Kazakhs scored twice in three minutes just after the midway point of the second to take a 3-1 lead heading into the final period. Norway failed to convert a power play early in the period and then managed to hold off a Kazakhstan 5-on-3 advantage for 1:52 as Ole-Kristian Tollefson was sent off for slashing just 8 seconds after Mathis Olmib was whistled for hooking for Norway. With 2:28 remaining in the game, Norway pulled goaltender Lars Haugen. 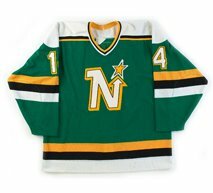 1:11 later Jonas Holos converted for the Norwegians to make the deficit one goal with assists from Mats Zuccarello and Patrick Thoresen. Norway again pulled their goaltender in a late bid to tie the game with 1:02 left to play. Then, with just 21 seconds to go, Ivan Kuchin was sent off for Kazakhstan for boarding. With their net still empty, Norway now had a 6-on-4 advantage and it would take just 7 seconds for Anders Bastiansen to thrill the home fans when he tied the game at 3-3 with 14 seconds to play. With each team assured a point as the game went to overtime, it was Kazakhstan who took the win and the extra point that came with it when Brandon Bochenski scored at 31 seconds from Nigel Dawes and Kevin Dallman - good Kazakh boys all. Kazakhstan were not able to duplicate their success on Friday however, losing 4-1 to France. Their regulation and overtime wins gave France 5 out of 6 possible points and have them atop Group F heading into the final day of play today. Norway also booked their place in today's deciding game with France when then beat Italy by an identical 4-1 score. The Norwegians now head into today with 4 points in the standings from a regulation win and an overtime loss, one back of France. But that is of little consequence, as the winner of today's game, regardless of whether it is in regulation or overtime, will earn the place in the 2018 Olympics because if Norway requires overtime to win, leaving both teams tied at 6 points, Norway will have won their head-to-head matchup. Today's Norway vs. France game can be streamed live here. 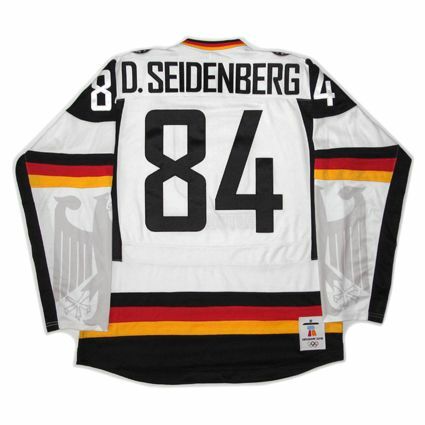 Today's featured jersey is a 2010 Germany National Team Dennis Seidenberg jersey as worn by Germany during the last time they qualified for the Olympic hockey tournament in 2010 in Vancouver. Germany had competed in every Olympic hockey tournament dating back to 1952 until they failed to qualify for the Games in Sochi, Russia. Going into the qualification process, Germany was ranked 10th in the IIHF World Rankings, the highest of all the teams not automatically entered into the 2014 Olympics. As one of the top three nations not automatically qualified, they were the host of the Group D Final Qualification Tournament. They opened with a 5-1 win over the Netherlands, but their hopes took a blow when they lost to Italy in overtime of their second game. 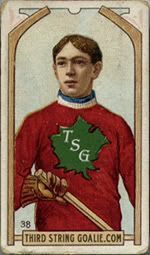 They desperately sought to get the goal they needed to defeat Austria in regulation to claim the place in Sochi, but it was not to be as the game went to overtime, giving Austria the margin they needed to eliminate Germany before the overtime even began. Rubbing salt in the wound, Germany would go on to win the game, which was followed by the most depressed "victory" celebration in hockey history, as the Germans had won the battle but lost the war. Prior to 2014, Germany had won a bronze medal back in 1932. During the time after World War II when the country was divided into East and West Germany, a single team was sent to represent both halves of Germany in 1956, 1960 and 1964, with both nations sending separate teams to the Games in 1968. 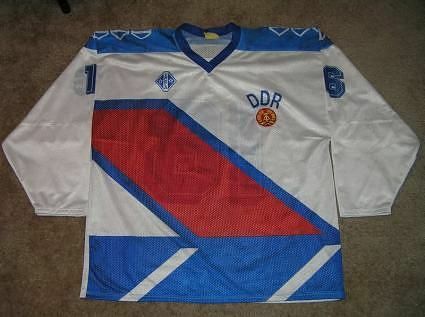 Following that, the East Germans de-emphasized team sports such as hockey, and only the West Germans sent a team through 1988, with the highlight being a bronze medal in 1976. 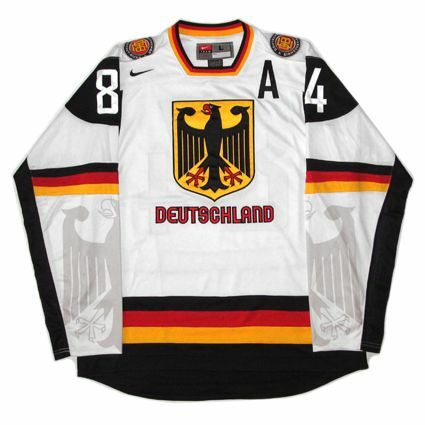 From 1992, following the reunification of Germany back into a single nation, they continued to appear at the Olympics through 2010, with their best results being 5th place in both 1984 and 1988. 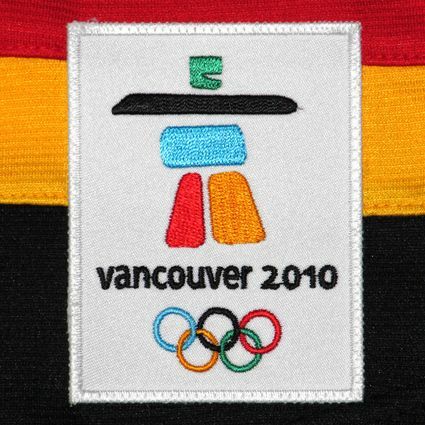 This jersey was first worn for the 2010 Olympic Games and continued to be used until being replaced for the 2014 Olympics, first by the German women's team and later by the men at the World Championships later that spring.